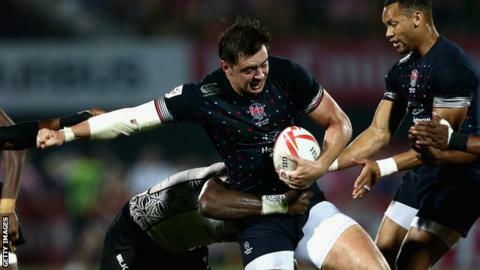 England were beaten 24-14 by Fiji in the third-place play-off as hosts New Zealand won the Wellington round of the Sevens World Series. Alex Gray and Tom Mitchell scored tries for England, who were beaten 25-5 by New Zealand in the semi-final. The Kiwis came from 21-7 down to beat South Africa 24-21 in the final, Joe Webber going over with the last touch. Scotland lost 19-7 to Samoa in the Bowl final between the teams who finish third and fourth in their groups. New Zealand, who claimed a hat-trick of Wellington titles, featured two-time World Cup-winner Sonny Bill Williams, who scored a try with his first touch on his rugby sevens debut in a 38-7 win over Russia on Saturday. He said: "I'm privileged to be playing with such great players, I've got a lot to work on and it's a learning curve, but I'm just glad to be doing it with these guys." The 30-year-old has committed to the New Zealand sevens team with the aim of playing at the 2016 Olympics in Rio. Despite their defeat in Wellington, South Africa top the overall World Series standings after reaching the final. They are two points clear of Fiji, with New Zealand in third place and England are fourth. England coach Simon Amor said: "The boys gave it their all this weekend. They didn't quite get it right in attack in those final two games but we have a young team out here and it has been an amazing experience for them playing against two incredibly physical sides, I'm proud of them."